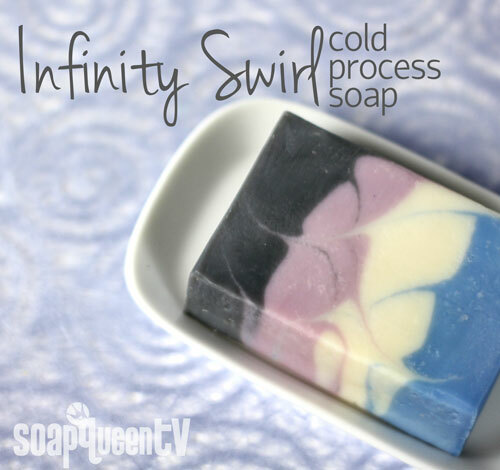 The infinity swirl is a beautiful method for adding an interesting design to your soap. And it’s really easy to do! The Multi-Pour Sectioning Tool is a re-usable tool perfect for this technique, but you can make your own out of cardboard. Although I love the wispy look, if you want a bolder design just use a swirling tool with a wider diameter (like a spoon handle) to drag more of the colors together. Scented with a blend of Lime and Crisp Anjou Pear fragrance oils, this soap smells fresh, sweet and crisp. Find out how to create it via the Soap Queen TV video below! Have you tried the infinity swirl technique yet? We love to see your projects on Facebook and Instagram! Now that Brambleberry makes the sectioning tool for the smaller mold, I tried it and cut it this morning. Of course, I had to adjust the amounts and colors for the smaller batch so it is slightly different. However, it turned out great. Thanks for the idea. I have a bag of quickmix and I think I’m going to try the red, white and black hanger swirl you folks just posted. Make sure to avoid aluminum – that can react with the lye and create toxic fumes. I’m a newbie to soap making. Love your site! 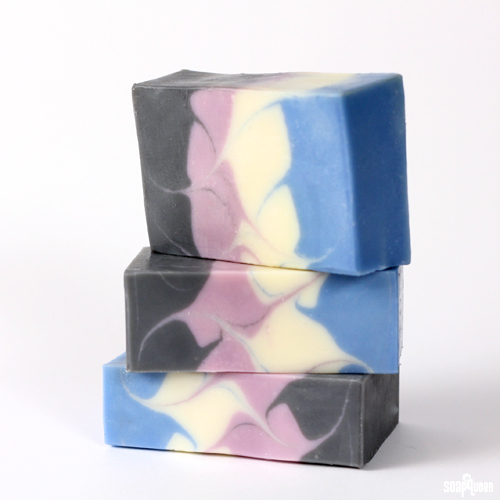 I want to make a spicy masculine scented soap. Maybe like old spice zanzibar or safeguard beige. Have you got any suggestions? Absolutely! We have some awesome masculine scents you may like. Shave and a Haircut Fragrance Oil and Zanzibar Spice Fragrance Oil would be an awesome mix, and should get you close to what you’re looking for. Another spicy masculine combination would be Tobacco and Bay Leaf and Bay Rum Fragrance Oil. Earthy and spicy. Question, do you factor in the oil you use with your colors when calculating a recipe? So do you mean that as a tablespoon is 0.5 oz that if you were using 4 colors than that would be 2 extra ounces. So you should run that through the lye calculator? And if you don’t, wouldn’t that just be considered superfat? I’d just like to know because I’m not partial to oily feeling soaps. P.S. I’d also like to offer a suggestion that for any other recipes you guys put forth could you always give a suitable, more common substitute for any exotic oils you guys use. I can’t imagine a whole lot of people have chia seed oil laying around.